Meillassoux made a major splash in the world of contemporary philosophy with the publication (and more specifically, the English language translation) of his pivotal work, After Finitude: An Essay on the Necessity of Contingency. Ostensibly launching a new realm of thought organized between the titles of “speculative realism” and beyond, the book posited the idea that, despite what the last few centuries of philosophy has decided, there is a world that can and indeed has existed outside of any phenomenological experience of it; to assume that the world is dependent upon the humans who inhabit it ignores the idea that the world turns whether or not we, as humans, exist on it. And to do so it meticulously examines how this is possible with what have been traditionally described as the hard sciences; math, physical science, geology, etc. The Number and the Siren, on the other hand, turns away from the world and instead focuses on a singular work of poetry that already has a hold over the 20th and 21st centuries—that of Mallarmé’s game changing Un Coup de Dés jamais n’abolira le Hasard. 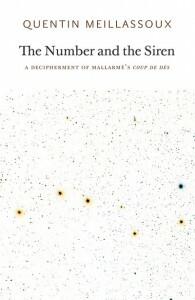 Mallarmé’s poem has been an insistent staple in the development of poetry since its publication, but Meillassoux’s approach to the work is both unique and, truly, astounding. When considering the diegesis of a work of literature, we look at a book as its own internal world, in some modes of thought as a self-contained entity oblivious to the outside. This is both an often short-sighted AND revelatory method of reading a text. Meillassoux’s study, breaking from the general studies and understandings of Mallarmé’s brilliant poem, posits that the poem itself can literally be deciphered, that meaning exists not exclusively in the blatant language or form of the poem itself, but rather that meaning is embedded, coded, within the work. Consider the first line of the book’s conclusion, “Thus, modernity triumphed and we did not know it.” And now, having read that, consider what that line means—the entire trajectory of contemporary literature after modernism, having more or less taken, as its launching point, the failure of modernity and how we can surpass that failure, as a futility. If modernity itself triumphed, instead of failing, and we just didn’t notice, the state of literature right now is clearly outside of the position it would be in otherwise, had we as readers noticed the turns that Mallarmé, in his secret genius, realized. The great narratives of modernity, posited by other thinkers, from Marx to Hugo to Zola, all of these have failed. And this is so, this is a fact. But if Mallarmé’s grand narrative, outside of the humanist insistence brought about by the aforementioned authors (and a whole catalog more), has secretly succeeded, then the nature of this grand narrative, of course, is essential. And so, by deciphering Mallarmé’s text, this is what Meillassoux sets out to show. The narrative level of Mallarmé’s poem, very apparent from the poem itself on a surface level (even explicated in its title), of course examines the ideas of infinite chance. Meillassoux says, “How to struggle against infinte chance with a throw of dice if all results amount to the same—that is to say, to its infinity, to its equal absence of sense in perfect verse and in mediocre verse?” And thus is the narrative that Mallarmé seeks to explicate. His idea of the total book, explored in prose fragments before the completion of his master poem, posit this sort of infinite totality found within the book, the Book as life, beyond art, beyond the idea of a total art work, but of life itself. What’s interesting about Meillassoux’s study is not that he manages to decipher the poem and concludes with such a banalized note of grandiosity (which is a stunning literary move in its own right), but rather that the steps Meillassoux takes to demonstrate to us, as readers, his solution, are exciting. The structure of this book, which could deftly become a chore under less articulated means, composes what is read as a sort of suspense0filled mystery novel, only the speculative nature of the events being looked at have a larger result than that, simply, of narrative. Despite my regular preaching that “spoilers” are irrelevant when considering the value of a book or movie (narrative, let’s say), I find myself insistently wanting to avoid actually revealing how exactly Meillassoux does this, as the experience of reading the book, at a personal level, brought me a new level of glee, a sort of insistent jouissance—I literally would start giggling on the BART as a new turn was taken, and while it might seem absurd the pleasure of this book matches its overarching success. And with that, I will leave in the silent futility of our hidden modernity’s greatly successful grand narrative.